Jolie Maxtin: Let's Get Acquainted! I think you are doing a grat job with your blog. I enjoy reading it and following your progress, successes and bumps along the road. One suggestion, might be to add an opportunity for your readers to subscribe by email through feed burner. I follow you through the google friend connect, but frankly, I only check for blogs in my reader once a week. I like having subscriptions sent straight to email so I don't have to hunt for the latest happenings in the quilting world, but that's just me. Others might disagree. Keep up the great work! I think your blog looks great - It has a "professional" look about it:-) It's really attractive to look at, and easy to navigate. I like how bright & cheery your blog is! And that you only have one sidebar. That placemat is adorable and it was so nice to find your blog and learn a bit about you through the hop! Your blog looks clean and fun - in other words, inviting! Hi Julie, nice to meet you. I'm here for the first time through the blog Hop and I think your blog is lovely. Your blog header is very cheerful and eye catching. Your place mat it adorable. I really like the fabric with the watermelon slices. Great post and tutorial Julie! Glad to learn more about you. You already know I love the look of your blog but if I think of anything, I'll email you! I like that your page of quilts includes the post-- a lot of times, people's quilt pages just have pretty quilt pictures, but no way to go back and read about their process of making them! So I like that your includes the posts as well as the picture. I love the colors on your placemats! The only (small) suggestion I would have for your blog is to move the followers gadget closer to the top...or at least make sure that you order your side bar in order of importance. I like it when the follow button is easy to find, but don't think I've ever looked at someone's archive. Yes! Pezzy Prints :-D I do love me some pezzies. I just wish they had given us a purple instead of that brown ;-) I so enjoyed your post! Julie, this was wonderful! Great fabrics on your favorites list. I absolutely love your blog header...so cute! I can't wait for the next round of Modern She Made Swap -- I enjoyed the first one immensely. Hope you have a wonderful weekend ahead! Nice to meet you along the Blog Hop! Hi Julie, nice to meet you! Love the tutorial, and I really like the clean and colourful look of your blog - less clutter makes it easier to focus on the content and style of the blogger. And your header is awesome - did you make the graphics? Nice to meet you! This is the first time I've visited, and your blog looks really good from inside Google Reader. 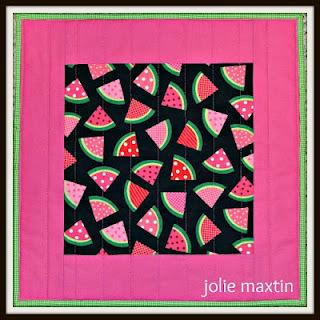 Love the watermelon fabric! Nice to meet you Julie! 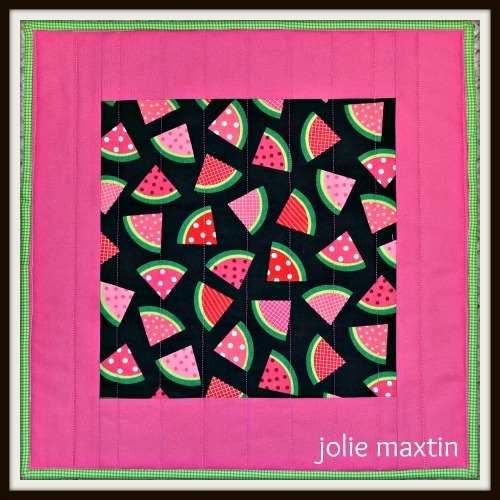 The placemats are so cute with the watermelon fabric and great tutorial. I think your blog looks fantastic, I love how crisp and clean it is and also easy to navigate. My only suggestion for a change would be to add a way for others to follow you via email. I don't really use Google Reader, but would love to follow via email! I have a feeling if you add that your numbers would increase. Good luck! I found your blog at Lily's Quilts. This is my first time visiting! Your blog is beautiful and its design perfectly reflects the "fresh, simple, modern" style you mention in your "about" section. I did think your name was Jolie, based on your blog's title - glad I skimmed the commenters before me and then double checked on your "about" section:). I meant to say I found your blog on Plum and June's blog hop! OK... too much blog surfing... must... sleep! Nice to meet you and visit your blog. Love the watermelon print. I have quite a collection of all kinds of fruit and veggie fabrics. Thinking I might just need to make some placemats to go with my food quilts. Thanks for the tutorial. Lovely to get to know you! Your placemats are so bright and cheerful - perfect for summer! Very lovely place mat. It's fantastic for this summer season. As for the blog. Don't worry about it. It looks great! Your tutorial is very well done. Great job. Will check out the blog hop in the fall. I love ur fruit fabric in the post below. Thanks for sharing in the bloghop. Thanks for the tutorial - a set would be a great gift for my mother in law. I like the clean lines of your blog.